We are dedicated to providing you with the highest quality dental products, which are custom-made in our laboratories from impressions or scans. All our products are manufactured following globally recognised processes. Our principal manufacturing partner produces restorations under a quality management system that is certified under ISO 9001:2008 and ISO 13485:2003. 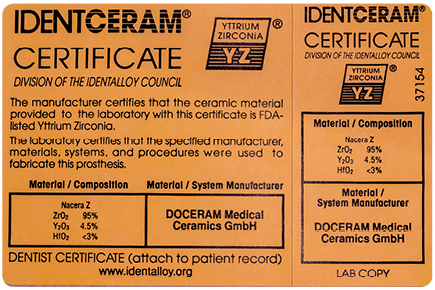 The materials we use have IdentAlloy® and IdentCeram® certificates. 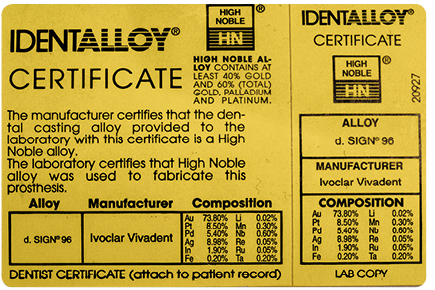 We source them from recognised global dental suppliers and we use extensive cataloguing and batch numbering, so that every product we make is fully verifiable and its manufacture history can be traced if need be. You can find Safety Data Sheets for all the materials we use here. We are confident in the quality of our products and workmanship. All our crown and bridge cases are guaranteed for five years* with the exception of our Fully Milled Zirconia product which has a guarantee of 10 years* and Layered Zirconia crown which has a guarantee of 10 years* for framework and 2 years* for complete restoration. Our industry leading guarantee means that when you buy from us, you’re safe in the knowledge that you are providing your patients with the highest quality products. We’re sure they will be satisfied too. At Southern Cross Dental, we take great pride in our work and we look after each job as though we were making it for our own use.